When learning how to grow Network Marketing Business most of us start reading the best network marketing books we can find. But since most network marketers are not where they want to be, it’s obvious that a book doesn’t hold the answer for everyone. Top money earners in Network Marketing all share some common traits from which we can form an effective plan for success. First, you need to collect 20 prospects a day. Now before you say that can’t be done by you, read this article I wrote about it called Network Marketing Success From 20 Prospects Every Day – Click HERE to read it. It’s amazingly simple! Now, you can not rush this formula. If you do, you lose – it’s that simple. Communication is the key. More importantly is How You Communicate. First, there is the greeting. This turns into a conversation. What the conversation is about determines the success of forming a relationship which is Required before you ever present your opportunity! You create your conversation from things that the two of you agree on. You begin this by talking about things in the environment like temperature, a chair, the speed of an elevator, a table, earrings – anything. For example: You say “I haven’t been outside, is it cold out?” to focus your prospects attention upon the weather, which serves indirectly to focus them upon you, and to talk with you about it. Then, their response to it, or their lack of response to it determines what you say next. If they brush you off, they’re not a good prospect – 1 down, 19 more to go! You see, conversation between two people creates another entity – the relationship. This relationship is both of you. In those crucial beginning seconds someone has to start creating the relationship long enough for the other person to also contribute to it. A proper greeting occurs when you are able to get the other person to talk openly and freely with you. This must occur before you move on to qualifying the prospect. It is very important to not be too assertive in the conversation. What that means is saying “this elevator is fast” is safer and less intrusive than saying “I like your earrings”. It’s strange, but you don’t want to be interested in the prospect when you first meet them. Instead pick an object to be interested in first. Once the other person starts to contribute to the conversation, you can slowly shift to being interested in them. 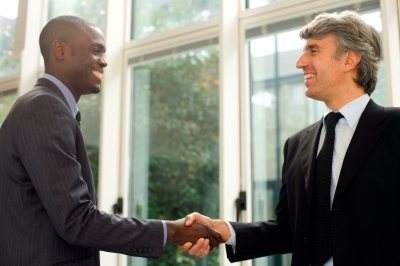 When greeting someone, your intention should only be to meet them and get to know them. Do not greet someone thinking “I can sell my stuff to them” because they will sense it and you will fail. There is a Formula for all this called the inviting formula. Basically it is in three steps. In step one you just have fun greeting and meeting people with the only goal being to meet people. Confirm that they are open to talking with you and then find out what they need and want. When people are open to you, they tell you about their life, their family, their job. Until this happens, do not qualify. Qualifying someone is different that determining if they have a job, or can afford to get into your business. Real qualifying is simply finding out what they need, want or don’t want. More importantly you must find out why. Why is it that they need, want or don’t want something. So the definition of qualify is to confirm that they are capable and willing. If they love their life, their job and haven’t nothing more they want – they don’t qualify, period. This, is where most people in network marketing mess it all up. If you can accept they’re not qualified, and just build a friendship, months from now everything could change and they would be a great prospect for you! Because you have become their friend, they will come to you for help. There is a lot more I could say about these steps, but I’ll stop here. I’m going to talk about the all important Invite step (and the Network Marketing script that works) in my next post. See you tomorrow. Previous post: Who do You Think, You Are?